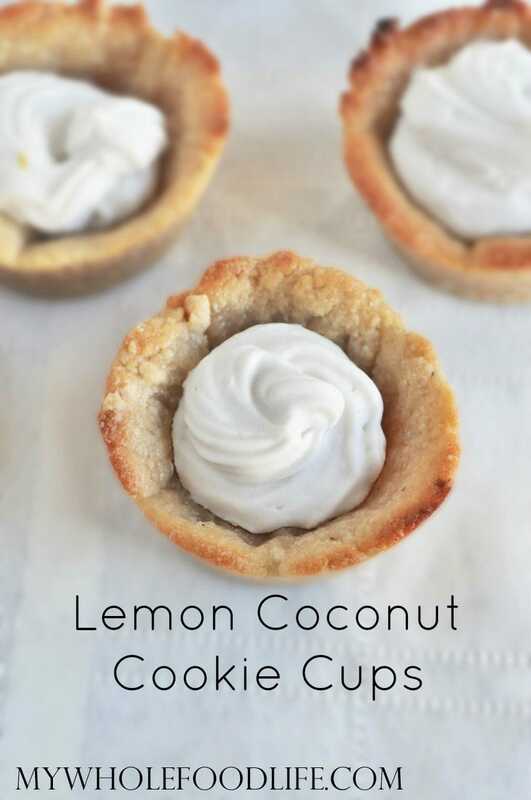 If you like lemon and coconut, you must try these Lemon Coconut Cookie Cups! The other day in my Facebook group, someone shared a recipe for cookie cups. Well I saw that and had to make my own version of cookie cups. These cookie cups are vegan, gluten free and grain free. They also only contain 5 simple ingredients! If you like all things lemon, then you may also like my Healthy Lemon Tarts or my Lemon Cookie Dough Bites. It took me a couple days to be able to shoot the photo for this and Marcus kept begging to eat them! These are absolutely delicious. I used a coconut whip cream to make the filling. So yummy! If you want a visual of how to make the coconut whip cream, you can watch this video. A pretty dessert perfect for summer! In a food processor , combine all the cookie cup ingredients and blend until smooth. Press the dough into greased muffin cup pans . Make sure you press the dough all the way up the sides to form cups. To make the filling, place a can of coconut milk in the fridge overnight. After the can has been in the fridge, open it up and scoop out the white fatty part and place it in a mixing bowl with the maple syrup, lemon juice and lemon zest. Save the leftover water for smoothies. Using a whipping attachment on your mixer , mix until you get a whip cream consistency. If your mixture looks a little watery, place it in the fridge for about 15 minutes. Spoon the whip cream into a pastry bag and pipe the filling into each cookie cup. These should last a few days in the fridge. Enjoy! Would this work with sunbutter for a nut - free vetsion? I just tried it w/ sun butter & they did not come out of the muffin tins. I also don't like the flavor - I think the flavor would be much better w/ cashew butter. Yum! My birthday is Monday. I think I want these for my treat. Am I missing something? The crust ingredients listed here are : cashew butter, maple syrup, and lemon juice. I assume there is a flour of some kind?? I'll be darned :/ I'll can't wait to try it! Thanks!